This multi-part tutorial is a complete guide to setting up WordPress on AWS. In this part of our tutorial we’ll set up load testing and benchmarking, we’ll optimize the content delivery, and we’ll change DNS to take the website live. Fiddler is a great logging proxy to inspect headers. I ran Ubuntu in a local VirtualBox instance with its own IP address, ran Fiddler on my Windows PC, turned on the “allow remote computers to connect” option and I answer my performance problem question very quickly. Update, after publication. A new, useful benchmarking tools is h2load. It’s worth considering as it does http/2, but I tried it and found it impossible to install and get working. Siege is the other load testing tool we’ll use, for testing just the performance of page loads, not including static resources (though I think it can do that). You can install it on your current instance if you like, your PC, a virtual machine on your home PC, or another AWS instance. If you use another AWS instance you may have to request an instance limit increase – it tells you how when you try to start one, but this is the ideal case for spot instances. Just spin up an m3.medium spot instance for 1-2c/hour (or so) for the time you need it. Siege takes about 2 minutes to install so there’s little overhead, and once it’s running you can take a snapshot so you can start it later even more quickly. So yes the testing instance does make a significant difference. I’m surprised testing from the instance itself was so low, since CPU usage was only about 8% during the test. The reason why is explained in this article, that it’s basically just latency causing the issue. If you have 50ms latency then you can only get to the server (1000 / 50 ) = 20 times per second. This means Siege is a good test to show if your changes have had an impact if testing locally, but otherwise isn’t very useful. I also checked external bandwidth with SFTP running multiple threads: as at Jan 2016 a T2.Micro instance can easily handle 10Mbps up and 30Mbps down, which is the speed of my home internet connection. I’ve also done SCP between two instances and gotten 50Mbps. One thing I noticed though: these things can transfer a lot of data, and data transfer out of your EC2 instance is charged even if it’s to another instance, though it’s not that expensive it can add up during performance testing. Installing Siege is pretty easy – note that I enable the Enterprize packages repository, install, then disable, as it has some newer packages than are in the Amazon repository and I don’t want to mess things up. Now configure the URLs you want tested. Change these two lines as follows. The first keeps the http connections open, which doesn’t simulate real world usage but helps us load the server more. The second tells siege we’re benchmarking, not simulating real traffic. Here’s another example, which has 30 clients (c30), 5 requests each (r5), 1 second between requests (d1), with no time limit. If you happen to want to test a single URL, which can be handy for diagnosing problems with a website, you can use this. The second command is a curl to get just headers, which can be good to see if a URL is returning 301 redirects. If you have problems working out what’s going on Fiddler is invaluable. Set it up as a proxy on your PC, set up an Ubuntu virtual machine using VirtualBox, and watch the headers to diagnose problems. You can add headers in your Nginx locations to help work out what’s going on. For example, this helps you work out what location is being triggered for a given request by adding the Z_Location header to the response. # If the file can't be found try adding a slash on the end - it might be a directory the client is looking for. I was trying to work out which cookie was preventing caching, this technique helped me work out which it was. These techniques have been invaluable to help me track down issues and diagnose Nginx issues. Siege is a great benchmarking tool, but it kept giving very low scores for a few URLs. We installed Apache Benchmark to help with our diagnosis. You can find its manual here, with a description of the output. The key metric we’re interested in is transactions per second. By comparing the requests and responses of AB and Siege using Fiddler we worked out what our issues were. Mostly it was cookies, but there was also a small mistake in one configuration file. Most WordPress installs use plugins to cache the pages (among other things) and accelerate pages using caching headers. While this is a good approach for shared hosting where you have little control it still means every page request has to hit PHP, run through plugins, etc, which is relatively slow. A much faster way is to do the page caching in Nginx, which is super fast, so long as we can cater for cache flushing and not caching logged in users. This will increase our website performance, scalability, and make better use of the limited resources of our little AWS t2.micro server. We’ll test a caching plugin just to see how it compares. Nginx has a great article on microcaching which is well worth reading. This part goes inside the server block. It’s evaluated on each request to decide if the request should be cached or not. # based on my analysis I'm currently using the second uncommented line and it seem to work just fine. This is the location that runs PHP using HHVM. The second half tells it when to use the nginx fastcgi cache. # an hour. This will help mitigate high loads which could effective denial of service attack PHP / HHVM. Nginx is smart enough to cache things, but the open source version doesn’t clear the cache based on POSTs – ie changing pages in WordPress. It does time cached pages out however you set it up, but we really want the appropriate parts of the cache purged when we update the site. I originally tried the WordPress Plugin Nginx Helper to do this but I could never get it working. Instead the plugin Nginx Cache seems to work just fine on both single and multisite, and the only configuration is giving it the path of your cache, which is done in WordPress Admin -> Tools -> Nginx. I suggest you configure this for every site in your network, or all of your single site installs. But of course nothing is that simple, if you consider 4 hours effort simple. It took me many hours to work out why the “purge cache” button wouldn’t work – it’s because the cache is created by nginx with 700 permissions (ie no-one else can read or delete the file), and the plugin runs as the hhvm user (which we’ve set up as a new user, “tim” in my case). The only solution that I could find that works (which took me many hours to find) is to create a cron job that changes the permissions to 777, which I run hourly because I figure that’s probably good enough (NB: I later changed it to a crontab that’s run every 5 minutes so that the cache can be purged if you’re doing intensive work – Google crontab 5 minutes). You can always define a custom cron job to run as often as you like, this page says how. 777 isn’t generally a good permission to give anything, but given this cache only contains public information and it’s unlikely anyone can read it directly anywway I think it’s ok in this case. We now have Nginx set up to do super fast caching of all php files for us, with purging! Photocrati is a great theme, but it’s not set up well for caching or performance. I can see that when I switch from the WordPress default theme to Photocrati headers that prevent caching appear, but I can’t work out why and fix it in the PHP, so I’ll fix it in Nginx. I also noticed that if caching is turned on, and I have more than one Photocrati website on the same WPMU install the websites look and feel get mixed up. The following caches the dynamic style, which is really quite static once things are set up. # Photocrati dynamic styles should be cached by Nginx and by the browser. Cache control headers tell the browser and any proxy servers between the server and the browser what they can cache and how long for. This avoids the user having to request pages all the way from our server if they already have them, or if a proxy has them. We generally want all our static resources cached for quite a while, and some pages cached for a short to moderate time, though revalidating pages on each view can be prudent for sites that change regularly. This is CRITICAL to good website performance, especially when working with a CDN. We use a couple of different techniques to set cache control headers. First off we clear out any existing headers, like the very old Pragma which is not useful any more, clearing Expires headers (which is probably pointless since we set them later), and we clear the Server name for security. In some places we use an alternative format, for convenience. Setting proper caching headers is really critical to caching, so it’s worth spending some time on. This first location block sets up cache control headers for images so it can be cached by proxy servers, an expiry of 8days. Note that I stopped this running for ico files as I have something tricky working on those below. 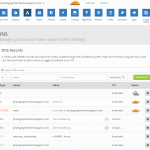 This also adds hotlink protection – just upload any file you like to the same directory as your wp-config.php file. This is the best way I’ve found to deal with favicons under Nginx. Intead of using a plugin that includes a reference to it in the page source this puts favicon.ico onto the domain root where it’s expected. This is better because whenever a browser requests even a single resource from a domain it requests the favicon. Note that if you have the mapping block already don’t add it again. My Nginx config files were getting pretty big at this point, so I moved each server into its own config file in the available-sites directory and set up symbolic links. If you’ve followed the whole tutorial this should be pretty trivial to do. If you haven’t followed the whole tutorial and can’t work this out go back to the start of part one and read up, or just download the files from part one of the tutorial. When we move our WordPress single site installs to multisite the images move. Returning 404 “not found” errors isn’t great for SEO, so we’ll redirect them. This took me quite a few hours to work out, but it was quite interesting learning about regular expressions and capture groups. At one point I changed permissions carelessly and got the following error in my nginx logs. It manifested that forced reloads wouldn’t load some css resources. [crit] 2491#2491: *1 open() "/var/cache/nginx/fastcgi_temp/1/00/0000000001" failed (13: Permission denied) while reading upstream, client: 111.69.x.x, server: photographerstechsupport.com, request: "GET /wp-admin/load-styles.php?c=0&dir=ltr&load=dashicons,admin-bar,wp-admin,buttons,wp-auth-check&ver=4.4 HTTP/1.1", upstream: "fastcgi://127.0.0.1:9001", host: "photographerstechsupport.com", referrer: "http://photographerstechsupport.com/wp-admin/index.php"
EBS snapshots really saved me on this one. Here’s the contents of my nginx access log, a long way through optimization. This is loading a Photocrati website, then hitting reload. We can see that most of the things are cached, but the “display_gallery_iframe” isn’t initially. A couple of tweaks to our nginx rules and everything is cached. This works because I know these websites rarely change, and if it takes an hour or a day for the new contents to be available, that’s fine. Of course we can flush caches manually if we want our content live immediately. Here’s the rule we put in to cope with this situation. (client IP) - - [25/Jan/2016:11:12:54 +1300] "GET / HTTP/1.1" 200 11673 "-" "-" "0.135" "MISS"
(client IP) - - [25/Jan/2016:11:12:55 +1300] "GET /?load_google_fonts&family=Open+Sans|Open+Sans:300|Open+Sans:bold|Open+Sans:100|Playfair+Display HTTP/1.1" 200 403 "http://www.example.com/" "-" "0.000" "HIT"
(client IP) - - [25/Jan/2016:11:12:55 +1300] "GET /wp-content/themes/photocrati-theme/styles/dynamic-style.php HTTP/1.1" 200 11746 "http://www.example.com/" "-" "0.000" "HIT"
(client IP) - - [25/Jan/2016:11:12:56 +1300] "GET /index.php?display_gallery_iframe&gal_id=49_1&gal_type=1&gal_cap=OFF&gal_page=true&page_template=false&bg=faf7fa HTTP/1.1" 200 2869 "http://www.example.com/" "-" "0.079" "BYPASS"
(client IP) - - [25/Jan/2016:11:13:10 +1300] "GET /index.php?display_gallery_iframe&gal_id=49_1&gal_type=1&gal_cap=OFF&gal_page=true&page_template=false&bg=faf7fa HTTP/1.1" 200 2869 "http://www.example.com/" "-" "1.096" "BYPASS"
(client IP) - - [25/Jan/2016:11:13:13 +1300] "GET / HTTP/1.1" 200 11673 "http://www.example.com/" "-" "0.000" "HIT"
(client IP) - - [25/Jan/2016:11:13:13 +1300] "GET /?load_google_fonts&family=Open+Sans|Open+Sans:300|Open+Sans:bold|Open+Sans:100|Playfair+Display HTTP/1.1" 200 403 "http://www.example.com/" "-" "0.000" "HIT"
(client IP) - - [25/Jan/2016:11:13:13 +1300] "GET /wp-content/themes/photocrati-theme/styles/dynamic-style.php HTTP/1.1" 200 11746 "http://www.example.com/" "-" "0.000" "HIT"
(client IP) - - [25/Jan/2016:11:13:14 +1300] "GET /index.php?display_gallery_iframe&gal_id=49_1&gal_type=1&gal_cap=OFF&gal_page=true&page_template=false&bg=faf7fa HTTP/1.1" 200 2869 "http://www.example.com/" "-" "0.099" "BYPASS"
(client IP) - - [25/Jan/2016:11:13:14 +1300] "GET /wp-content/themes/photocrati-theme/styles/dynamic-style.php HTTP/1.1" 200 11746 "http://www.example.com/index.php?display_gallery_iframe&gal_id=49_1&gal_type=1&gal_cap=OFF&gal_page=true&page_template=false&bg=faf7fa" "-" "0.000" "HIT"
(client IP) - - [25/Jan/2016:11:23:15 +1300] "GET / HTTP/1.1" 200 11673 "http://www.example.com/landscape/" "-" "0.000" "HIT"
(client IP) - - [25/Jan/2016:11:23:15 +1300] "GET /?load_google_fonts&family=Open+Sans|Open+Sans:300|Open+Sans:bold|Open+Sans:100|Playfair+Display HTTP/1.1" 200 403 "http://www.example.com/" "-" "0.000" "HIT"
(client IP) - - [25/Jan/2016:11:23:15 +1300] "GET /wp-content/themes/photocrati-theme/styles/dynamic-style.php HTTP/1.1" 200 11746 "http://www.example.com/" "-" "0.000" "HIT"
(client IP) - - [25/Jan/2016:11:23:16 +1300] "GET /index.php?display_gallery_iframe&gal_id=49_1&gal_type=1&gal_cap=OFF&gal_page=true&page_template=false&bg=faf7fa HTTP/1.1" 200 2869 "http://www.example.com/" "-" "0.000" "HIT"
(client IP) - - [25/Jan/2016:11:23:16 +1300] "GET /wp-content/themes/photocrati-theme/styles/dynamic-style.php HTTP/1.1" 200 11746 "http://www.example.com/index.php?display_gallery_iframe&gal_id=49_1&gal_type=1&gal_cap=OFF&gal_page=true&page_template=false&bg=faf7fa" "-" "0.000" "HIT"
For the favicon I created a new location inside the nginx site config, which refers to the $blogid defined at the start of the file. Refer to the final configs posted in part one. I got tired of typing /usr/share/ (etc) to get to my webroot, so I moved everything to /var/www/wordpress . It was fairly trivial to set up the permissions again and change the nginx config. Now that we’ve done all that it’d be a good time to benchmark WPMU without any optimisations, with browser caching turned on, with fastcgi caching, and with nginx caching. For this we’re going to use Siege. JMeter would be a much better real world test than Siege, as it download web pages and all associated resources while respecting caching headers, but we know serving static resources is fast and easy so we’ll concentrate on the active pages. Make sure to use the full URL, including trailing slash where appropriate. You can check for 301 redirects using Firefox and “Live HTTP Headers“. I discovered things were registering as slower than expected because I only had caching for pages set up, not for error codes like 404. By going through URL by URL for a half dozen sample URLs from each website using Siege and 5 second tests I found a subset of pages that were slow. This let me diagnose the problems and work them out. Increasing the number of clients didn’t increase the throughput, even though nginx CPU usage rarely goes over a few percent. I assume this is because of the limited network performance of the t2.micro instance. One day I may launch it as a larger instance to test that theory out. Performance testing from the instance, to the instance, gave results about the same as going via CloudFlare. Testing from another instance increased performance between 50% and 100%. Since CPU usage was low the network traffic limit is probably the bottleneck. Siege and Apache Benchmark usually gave approximately the same results, with Siege usually reporting higher numbers. This is probably because it uses HTTP/1.1 which includes keepalives, whereas ab uses HTTP/1.0. Here’s the results of my benchmarking. Note that it hits the nginx cache when it’s turned on, so that’s all we’re really testing. Testing was done from an m4.xlarge, which has “high” network throughput. As expected the Nginx fast cgi cache increased performance massive – our transactions per second increased by 4000% and our latency reduced by 98%. The load on the web server (the HHVM process that runs PHP) dropped from around 50% to around 1%. It also shows that if we have logged in users we’re getting 11 pages per second generated, which is enough for a lowly loaded website, but not enough for a website that gets a lot of logged in users. If that was the case more optimization would be needed, and probably larger instances sizes. The larger instances have better network throughput, and some types (M, but not T) come with directly attached instance storage which could really accelerate anything that can be cached on that storage. This shows that HHVM is taking 33% of the system memory (336MB), nginx is taking 3.2% (32MB), and nothing else really takes much else. The rest is taken up bu caches and buffers, which are used to improve performance. This suggests that the system has plenty of RAM to run MySQL if we decide to move it out of RDS when our free tier runs out. All in all the performance of the system is easily good enough for what we need, for running a few low to moderate volume websites where few people are logged in. Basically all the CPU is used by Nginx when page caching is on, and by PHP when page caching is off – as you’d expect. I ran a quick test on one wordpress install with page caching on and off. WordPress uses Photocrati, which dynamically generates CSS, so I’ve cached this in the Nginx page cache. Testing was done using webpagetest.org, which tests loading the page and all resources. I ran 9 tests from Wellington, New Zealand, which has approx 220ms ping to the source server, but has only a 10ms ping to the nearest CloudFlare data centre in Auckland. This is a 33% improvement with a simple web server configuration – an easy win! This one is going to be different for everyone, but the concept is quite simple – you need to change your A or CNAME record for each domain you’re moving to the elastic IP you have your server running on. 24 hours before you plan to do your migration change your DNS record TTL down to a low value like 300 seconds, so your migration will happen reasonably quickly. Not everyone respects this TTL, so beware it could take 24 hours. TTL Time To Live, essentially how long DNS records are cached for across the internet. Security Note: Note that there are often a lot of junk DNS records lying around, which often don’t help and can give away the IP address of your server. One advantage of a CDN is it prevents denial of service attacks, but if an attacker can find your IP address the CDN can’t help you. If you’re using a CDN it’s best to delete any DNS records that you don’t absolutely need – mail.example.com, localhost, ftp.domain.com, etc. A CDN proxies your requests so your clients will never know the IP address of your origin server. IMPORTANT NOTE regarding email: we haven’t set up an email server on this server, so you’ll either have to work that out yourself or (a better option) host your email somewhere else. I have my email hosted on FastMail, I find them excellent in terms of performance and value ($5/year + $10/year per lite account / domain), but Google Apps (a paid version of Gmail for business) is more popular ($5/month/account). You set up email by changing your MX records. Email migration is a service we offer, if you have any trouble you can contact us for help. There are probably hundreds of different interfaces to change DNS, so there’s no point me trying to cover that. I suggest you use Goggle to search for “How to change DNS records Godaddy”, or whatever you need. 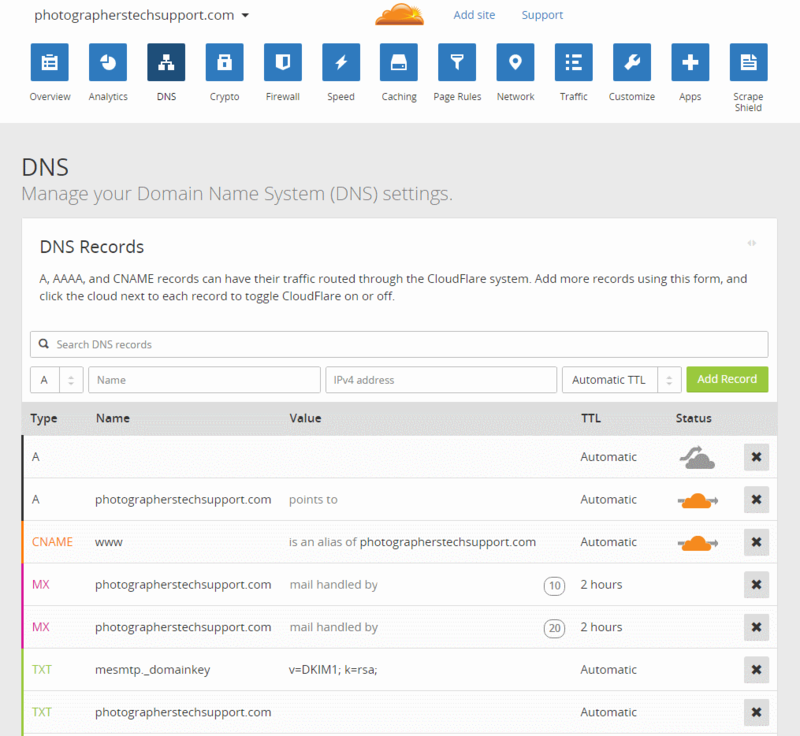 Here’s an example of my DNS setup, in CloudFlare. Click to make it larger. At this point you should a fast, well optimized WordPress server running on your AWS instance, and you could easily go live at this point. Read part five of our AWS/WordPress tutorial to learn how to add https and HTTP/2 to your website to secure and accelerate your website. I used quite a few different resources to help put together this hopefully simple guide. Here’s a list of what I found most helpful. Nginx WordPress Optimisations (note that their caching didn’t appear to be all that effective, but then again I may have done it incorrectly). Nginx configuration explained and examples. Let’s Encrypt SSL on Nginx.